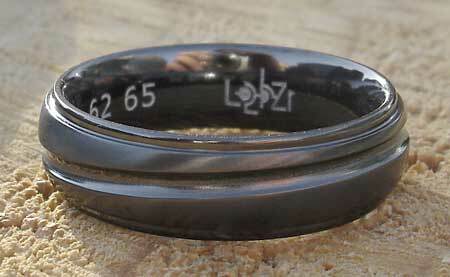 Men's Shoulder Cut Black Wedding Ring : LOVE2HAVE in the UK! 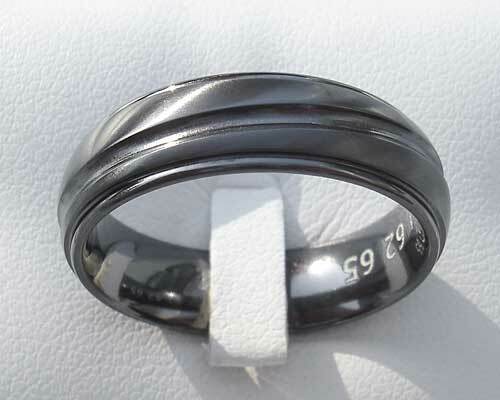 A shoulder cut profile black zirconium men's wedding ring with a single diagonal groove. The machined groove or slot runs at an angle around the entire circumference of the ring and is precision machined to perfection. The slot runs within the shoulder cuts in the raised section of the ring and is defined as it catches the light from all angles. The shoulders come in a polished finish. We can also provide different widths and finishes, but the standard 7mm is the most popular, together with a titanium version too which you will also find on our website.